0 Comments Published by Jane on Saturday, March 21, 2009 at 12:41 PM. A new McDonough image has arrived for me to share. Pictured is Mary M. McDonough Dowd with three of her four children - son John Dowd and twin daughters Marie and Anna Dowd. Mary is buried with her parents, Bartholomew McDonough and Margaret Fay McDonough in St. John's Cemetery in Worcester (see cemetery tour here). This photo was provided by Dianne Dowd - Thank you Dianne! She dates the photo to 1911 and I will assume it was taken in Worcester, MA. Mary Margaret McDonough Dowd was born on July 11, 1882 which makes her about 1 month older than her cousin Katherine McDonough Kennedy (middle row seated last on the left) who is the third of Thomas' ten children. 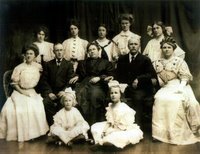 This photo likely dates to about the same time (give or take a few years) of Thomas McDonough's family in Worcester, MA. Thomas was Mary's uncle and all of his children were Mary's first cousins. It is interesting to click on each photo (to see larger) and compare the faces of the cousins. 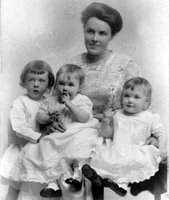 Another interesting thing to note that Mary and her uncle Thomas had in common - both had twins! Two of Thomas McDonough's daughters are fraternal twins. Could twins run in the McDonough family? Know of any Deedy's in Dingle?